For some, that means happiness, joy, and sweet memories. For others, it means sadness, grief, and bitter-sweet memories. The GriefShare organization has an annual event called, “Surviving the Holidays”. This helps in dealing with the intense pain of grief during the holidays. Local churches around the world sponsor these seminars. Find out where the closest “Surviving the Holidays” is to you. The event is about 2 hours long. It includes a 40 minute video along with some group discussion as you meet others that are dealing with grief during this holiday season. If you’ve never heard of or been to a GriefShare group, and you’re experiencing grief from a loved one’s death, this may be the perfect time of year to start. GriefShare is a grief recovery support group where you can find help and healing for the hurt of losing a loved one. When you go to the GriefShare website, you can enter your zip code to find the closest group to your home. I strongly encourage anyone who is presently experiencing grief, to seek out a local group. 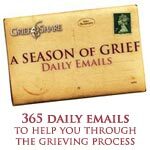 If you’re not ready for a group, another option to consider, is to receive daily GriefShare e-mails for an entire year. 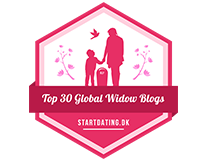 There are 365 daily messages that will help and encourage you through a year of the grieving process. GriefShare is a journey from mourning to Joy!